Get a boost in your effectiveness and efficiency with these tips! Thanks to Meridith Levinson of www.cio.com for capturing this and creating an awesome article and slideshow. All of your life you thought, hmmmm, I may be a little different than others in the way I organize, get things done, and generally fit in. You may have had trouble completing projects, getting motivated and getting started, and organizing your thoughts and your stuff. 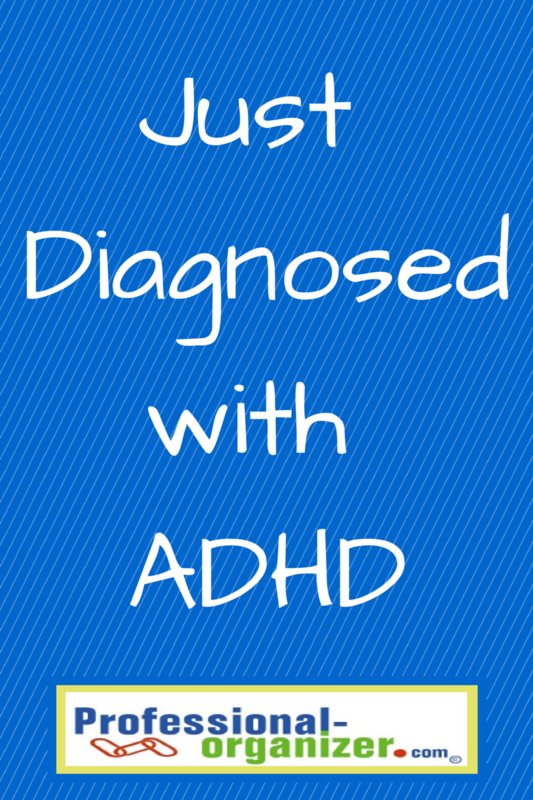 You decide it is time to learn more about yourself, and learn you have ADHD. Looking with objectivity of this diagnosis is difficult. If you have been recently diagnosed with ADHD, there’s a lot of information that can make a difference. Think of this diagnosis as one that includes challenges to Executive Function, a part of your brain that involves planning and processing. It is more than just attention and hyperactivity. Executive function can affect your daily life including being on time, transitions, getting started, organization, prioritizing, motivation, and working memory. You will want to create a team that educates, informs and addresses ADHD challenges. Associations are a way to connect and learn. These associations have online, national and local presence for you to tap into and learn about ADHD. Finding a local chapter makes for support and a sense of belonging in your community. Reading may be a top priority for you. Blogs and books offer a look into the life of families and individuals with ADD. Asking for help and creating your team are vital to your success. In the medical area, doctors, therapists, and psychiastrists will be vital. ADD Coaches are available to help you learn more about yourself and create the successes you need. 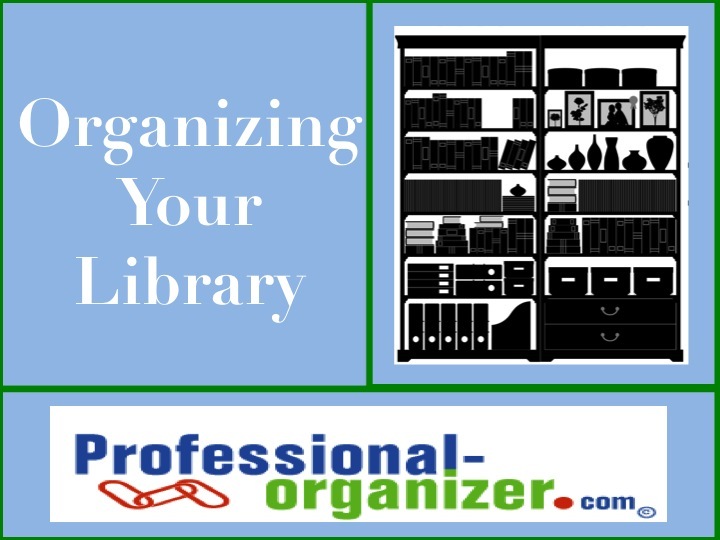 Certified Professional Organizers will partner with you to create successful organizing solutions. Learn what your strengths are and work from that vantage. Most important, surround yourself with nurturers who will help you set boundaries and help you be accountable. Success is around the corner! Learn more ideas about ADHD on my pinterest board. Join my monthly newsletter for a dose of organizing and productivity! Often my clients’ biggest challenges are making decisions. Organizing is overwhelming and they need help simplifying. They need help limiting choices. There are many options and they are not sure which is the right one. Having three questions will help you be more aware and focus on how your choices relate to your goals. ~For questions of productivity and time management, ask yourself: Does this activity align with my priorities, goals and dreams? There is that famous saying, we can have it all, just not at the same time. Our priorities need to help us make decisions, help us focus, and help us use our time to our best advantage. ~For questions about stuff, ask yourself: Do I love it or use it? If you really love it, is it being honored? Loving something means you treat it as a precious item. With functional items, how much do you use it? Not just “might need it some day”, but really use it? ~For questions about paper, ask yourself: Can I find this information elsewhere, like the internet, the library or by calling a friend? We keep too much paper because we are afraid of needing it later. There are so many ways to keep the information in a manner other than a file cabinet. What helps the most is often to have questions to ask, but also a partner to help coach you through the questions. What question(s) do you ask yourself to help you achieve your organizing goals? Thank you for being a part of my community! As a gift to you, I’d like to provide you with a Free Smead SuperTab Folder for organizing your paperwork. SuperTab folders have nearly double the labeling area of standard folders so you can use larger text or more lines of description. To get your free SuperTab folder, go to www.smead.com/SuperTabSample now. Hurry, these won’t last long! Thanks again for following me and I look forward to continuing to provide you with great content! Each year we vow to get started early for our holiday preparations. We also want to make the holidays more meaningful and connected, less about stuff and more about people. 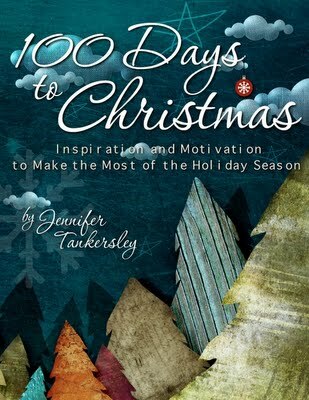 Jennifer Tankersley created the 100 Days to Christmas E-Book for you! Jennifer, owner of ListPlanIt, was inspired in 2008 to start off the holiday season on September 16, posting daily ways to get ready for your holidays. Overwhelmingly, the response was that of gratitude for daily tasks, setting goals, and offering encouragement during a busy time of year. For the first time, you have the opportunity to see it all up front without having to wait for the next task to be published each day. The 100 Days to Christmas 2011 eBook has everything you need to get started on your holiday planning and to further motivate you through a series of major holidays. On day 51, you are invited to share your blessings with a local food back. Each part of the holiday preparation, from budgeting, to sending holidays cards, to decorating, is included in baby steps, with a time line, to help you prepare your home. Most importantly with this preparation you are ready to enjoy the holiday yourself! That is the best gift of all! You can purchase 100 Days to Christmas at http://100daystochristmas.com/. Enjoy! For the past few weeks, our news has been filled with weather related emergencies, family’s homes being devastated, and natural disasters. On any given day, we could be faced with the unexpected in a significant way. In case of emergency, we want to have access to the very important papers we need to assist those we love. To be prepared, here is a list of documents and storage options for security and access. Personal records such as birth certificates, adoption papers, citizenship records, marriage certificates, divorce documents, military service records, passports and social security cards should be stored in a safe or safe deposit box. If you will need to refer to these items, make a copy and store them in your filing cabinet, listing the specific name of the item on a file folder in your “Personal” file drawer. Tax returns are required by law to be retained permanently. The supporting tax information must be retained for 7 years. (Although the IRS can only audit returns for the previous three years, many exceptions can extend the deadline.) Keep tax returns separately from your supporting documents. These can be kept in an attic or the bottom drawer of your file cabinet. For life insurance policies, you must retain the initial policy as well as any addendums. Keep these originals together, each in a file labeled with the name of the insurance company on the file folder, in a safe in your home. Keep a list of the policy numbers and insurance companies in a file in your “Financial” file drawer, labeling the file “Insurance – Life”. Any payments for these policies can also be kept in the “Financial” drawer. Legal documents, such as power of attorney and wills, should be kept in a safe in your home and at your attorneys. Give a copy of the document to the executor and family members. Do not keep these in a safe deposit box, as this may be sealed when the box owner dies. Property information for your home and auto, such as the deed to your home, mortgage, or car title, should be kept in a safe or safe deposit box. For home repair and maintenance bills, keep these in a filing cabinet labeled “Home Repair” in the “Home/Auto” file drawer. For auto repair and maintenance, label these “Auto-(name of car)”, and also keep these in the “Home/Auto” file drawer. A household inventory is important in the event of a home catastrophe. Your insurance provider will need proof of loss in the event of a fire, flood, or robbery. Videotape or photograph your possessions. Place the photos in a notebook with receipts and appraisals for expensive items. In the video or notebook, categorize the items in your home by room. Keep the video or notebook in a safe or safe deposit box. If your wallet is lost or stolen, it is important to keep a copy of the contents. Using a copy machine, photocopy the front and back of your credit cards, driver’s license, insurance cards and all else in your wallet. Store the copies in a file folder labeled “Wallet- (your name)” in your “Personal” file drawer. September is National Preparedness Month. 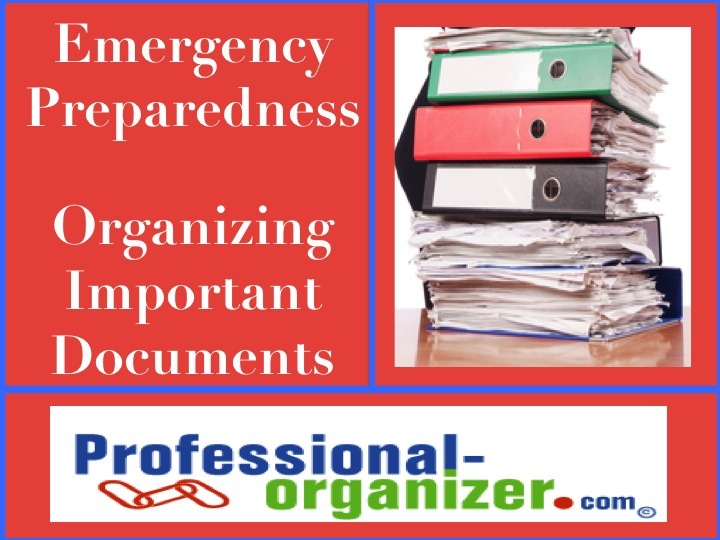 By organizing your documents in case of a family emergency, you will feel peace of mind and security. Your family will appreciate your efforts on their behalf!